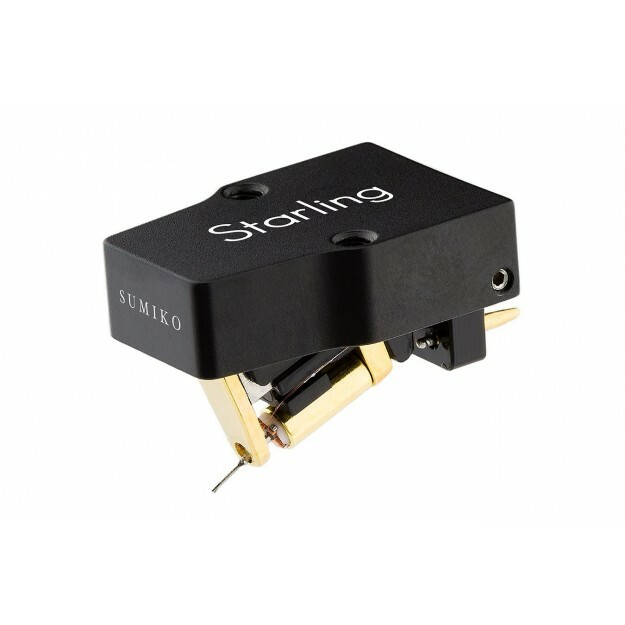 The Sumiko Starling MC cartridge completes the American manufacturer’s “REFERENCE” range. It is the version between the Sumiko Black Bird Lo MC cartridge and the very high end Sumiko Pearlwood Celebration II cartridge. It incorporates some electrical and mechanical components. This cartridge is especially the result of Sumiko’s 40 years of know-how. From the outside, the Sumiko Starling has an open architecture just like its smaller sister, the Sumiko Songbird MC cartridge. Due to its open architecture, this cartridge is free from resonances and lighter. It is a beautiful phono cartridge! Indeed, the black anodized aluminium chassis and the gold armature give this cartridge a high quality aspect. The aluminium was milled with extreme precision. It was chosen for its absorption and low resonance qualities. This chassis has two threaded inserts which is where are placed the two screws in order to mount this cartridge. We greatly appreciate this method as it is easier to mount the cartridge and it provides a better tightening torque than nuts. However, this will not please owners of “vintage” Thorens vinyl record players because their headshell from another time period is not compatible with this phono cartridge. Indeed, this headshell only fits with screws of a certain diameter and screws that can only be mounted from the bottom. The cartridge is connected to the cables of the headshell via plated gold Pins of excellent quality. This Sumiko Starling MC cartridge has a Micro Ridge stylus. This complex stylus shape tends to resemble the profile of a vinyl record groove. It extracts as much information as possible and limits surface noises and distortions. This excellent stylus is mounted on a boron cantilever. Not only does this boron cantilever provide a better rigidity than aluminium but it is also light. On the end of this stylus are 4 coils which use a very pure copper conductors. They were over coiled in order to obtain a low output level (0.5mV) and a low internal impedance (28 ohms). 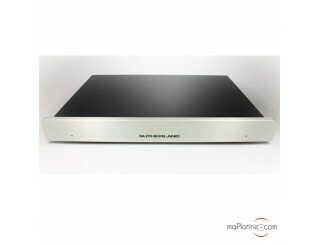 Thus, this MC cartridge is only compatible with MC phono preamplifiers that have a minimum gain of 58dB. This Sumiko Starling cartridge weighs 9.5 g and has a compliance of about 18. It is thus compatible with the majority of 9, 10, or 12 inch tonearms that have a low or medium effective mass (between 7 and 16g). From the opening bars, we notice that this is a high end cartridge with high standard performances! To begin, the surface noises are non existent. A true silence! The transparency and definition are remarkable, as they range from the extreme high to the extreme low. A special mention to this cartridge which rises particularly high, without any acidity. The bass is very punchy and articulated, with a grain specific to Sumiko cartridges. This presence and substance are also found on the voices and string and wind instruments. The sound stage is completely three dimensional! The different instruments are perfectly clear and placed, and offer a realistic space. The strong point of this MC cartridge is certainly its balance which is a true success. Some will prefer the neutrality of an Ortofon Cadenza Black cartridge or the sophistication of a Benz Micro Ruby Z. This Sumiko Starling MC cartridge will please music lovers and enthusiasts of dynamics, “warmth”, and those who do not want to make any compromise on the quality of the timbres.